Thank you for visiting this website. Please be sure to read the Terms and Conditions carefully since any use of this website constitutes your acceptance of the Terms and Conditions. YOU MUST BE EIGHTEEN (18) YEARS OR OLDER TO ACCESS THIS WEB SITE. IF YOU ARE UNDER EIGHTEEN YEARS OF AGE, YOU ARE NOT PERMITTED TO ACCESS THIS WEB SITE FOR ANY REASON. To access this site or some of the resources it has to offer, you may be asked to provide certain registration details or other information. It is a condition of your use of this site that all the information you provide on this site will be correct, current, and complete. If we believe the information you provided is not correct, current, or complete, we have the right to refuse you access to this site or any of its resources, and to terminate or suspend your access at any time, without notice. You may use this site for purposes expressly permitted by this site. You may not use this site for any other purpose, including any commercial purpose, without our express prior written consent. For example, you may not (and may not authorise any other party to) (i) co-brand this site, or (ii) frame this site, or (iii) hyper-link to this site, without the express prior written permission of an authorised representative of our business. 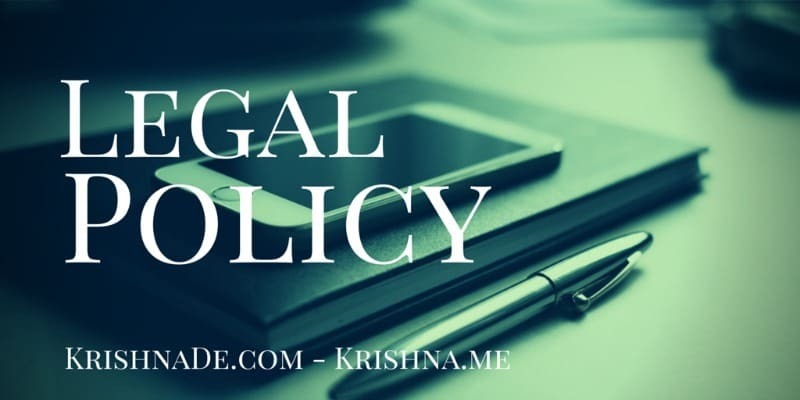 All copyright and other intellectual property rights in this website are subject to Krishna De’s and Krishna.me’s copyright as set out in the Copyright Notice. Trademarks, Service Marks, and logos appearing in this site are the property of Krishna De and Krishna.me, or the party that provided the Trademarks, Service Marks, and logos to Krishna De and Krishna.me. Krishna De, Krishna.me and any party that provided Trademarks, Service Marks, and logos to Krishna De or Krishna.me retain all rights with respect to any of their respective Trademarks, Service Marks, and logos appearing in this site. Any passwords used for this site are for individual use only. You will be responsible for the security of your password (if any). We will be entitled to monitor your password and at its discretion, require you to change it. If you use a password that we consider insecure, we will be entitled to require the password to be changed and/or terminate your account. BY ACCEPTING THIS AGREEMENT YOU WAIVE AND HOLD HARMLESS KRISHNA DE AND OUR COMPANIES, SUBSIDIARIES AND ASSOCIATES FROM ANY CLAIMS RESULTING FROM ANY ACTION TAKEN BY US DURING OR AS A RESULT OF ANY INVESTIGATIONS AND/OR FROM ANY ACTIONS TAKEN AS A CONSEQUENCE OF INVESTIGATIONS BY EITHER KRISHNA DE, OUR COMPANIES, SUBSIDIARIES AND ASSOCIATES OR BY LAW ENFORCEMENT AUTHORITIES AND THEIR AGENTS. We are not responsible if the information that we make available on this website is not accurate or complete or is no function of this website. Some of the pages on this website contain hypertext links to websites not maintained by us. We accept no responsibility for the content, accuracy or function of these other websites. We highly recommend that you make yourself aware of and carefully read the legal and related statements of all other websites that you visit. Krishna De, our companies, subsidiaries and associates shall have no liability or any responsibility whatsoever for any direct, incidental, consequential, indirect or punitive damages, costs, losses or liabilities whatsoever arising out of your access to, use of, inability to use, change in content of this website or arising from any other website you access through a link from this website or from any actions we take or fail to take as a result of any electronic mail messages you send us. If you choose to download material from this website you do so at your own risk and we shall have no liability or any responsibility to you or any other party for any loss suffered caused by viruses that may infect your or other parties computer equipment or other property by reason of download material from this website. Information appearing on this website is provided in accordance with and subject to the laws of the Republic of Ireland and the laws of the Republic of Ireland govern the conduct and operation of this website. The courts of the Republic of Ireland have exclusive jurisdiction over all claims or disputes arising in relation to, out of, or in connection with, this Legal Statement, the information contained on this website and any use made of that information. Any such claims or disputes shall be resolved in accordance with the laws of the Republic of Ireland.